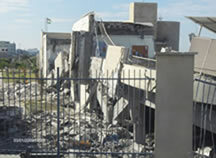 An ISR member has informed us that the American International School Gaza was destroyed early Saturday morning by Israeli Air Force jets. As a group of educators we may be able to offer help to the members of this school. We will keep you up-dated. Note: ISR has posted readers comments which may not reflect the views of ISR. Above all, We Support Peace. American International School Becomes the Latest Casualty In Gaza. While few knew of its existence, even fewer are aware of its destruction. The American International School, after surviving 8 years in war torn Gaza, has now been erased from the map after falling prey to the numerous air strikes from the Israeli Air Force. And while the world is bombarded with images of rocket damage to Israeli schools—one hole in one wall shown from multiple angles—there doesn’t seem to be a single image of the once impressive school that was obviously destroyed by multiple air strikes from a mighty Israeli war machine. Nor does there seem to be any coverage relating to the death of the night watchman, Abu Gleg—an elderly Bedouin, father of 30, who had generously donated the land for the school to build upon. The one sided nature of the military conflict has never been more obvious (over 400 Palestinian fatalities vs. 4 Israeli fatalities) and this incident with AISG seems to highlight the one sided nature of the media coverage of the conflict as well. The school was billed as ‘an oasis of learning’ and provided a safe haven for students and teachers committed to the pursuit of knowledge and understanding. In its 8 years, the school survived tank shells, qassam rockets, multiple militant attacks, artillery fire, sonic blasts, and kidnapping of foreign staff. And while there were periodic disruptions to the school year, the staff and students went to great lengths to keep the school alive and always completed each academic year. As part of the ESOL (Education Services Overseas Limited) family, the AISG uniforms and curriculum match many of the American international schools across the Middle East. At its peak there were over 20 foreign teachers recruited from Canada, Australia, the UK, etc… who committed themselves to providing a first class education for the 200 students. When it was no longer safe for foreign staff, the remaining students and teachers never wavered in their commitment to education and continued much as they had done since the school was created. It will be interesting to see what the future holds for AISG—it’s been tested time and time again and the students and teachers have always found a way to teach and learn. Obviously this will be their most difficult test, and given the current situation in Gaza perhaps keeping the school alive won’t remain a priority. However, if ever there was a time and a need for this school in Gaza it is now, and without it the bleak future for this little piece of land becomes a little dimmer. It would be appreciated if a more balanced and less politically charged report were given. 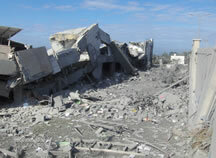 It was not noted that Israel was acting after more than 3,000 rockets had been fired into its land from Gaza. It is important to note that warnings were given by Israel to all of Gaza of the impending air strikes. No warnings were ever given when Hamas rained missiles into Israel. As an overseas teacher of thirty years I have always believed that my politics have no place in the classroom.However, as a responsible human being who spends her life with young people I believe we should now take some action. I realize that this is an educational forum, and an extremely valuable one that I have supported since it was first developed, and not a political forum. Yet, can we not do something to help stop this destruction of lives and property in Gaza? Would it be feasible for ISR to formulate a petition calling for an end to the air strikes, a petition that could be sent to the main governments of the signatories? We have to show the world we care and members who disagree would be free to not sign. Please, consider this request carefully before you take a decision. My husband and I were also teachers at AISG for a brief time. We have hoped that someday we could return to Gaza to visit and see the people of Gaza living in peace and prosperity- as they so deserve. This week leaves us with little hope of doing so. Thank you, Ryan, for a well-written account. I wonder if the Israeli’s warned anyone that such a beautiful school was about to be destroyed. To all of us so familiar with the classrooms, assembly hall, playground,faculty room, and the precious soccer pitch, it was more than glass and concrete- it was a dream and a hope for the future. AND- what could have been done to prevent the incoming weapon(s), anyway? I am sad beyond words for what is happening to Gaza. I worked at AISG for only a brief period of time in 2006, and because of fears for my safety held by family and friends, wasn’t one of the teachers who returned to complete the school year after a militant attack in March. However in the short time I lived in Gaza, I developed an enduring affection for AISG and the Palestinians I had begun to get to know. I had hoped that in years to come I would be able to return to work in Gaza. Perhaps miracles might yet happen. The destruction of the school by the Israeli military is extremely sad, as the school’s purpose, to provide an international style education for young Palestinians, would seem to be most necessary in these troubled times. The blurb for the photos on the ‘daylife’ web site state that the school was being used as a rocket launch site. One can only hope the military intelligence regarding this was one hundred percent correct, and that no other means would have been available for disarming the militants who were firing those rockets. I can’t help but wonder if the militants have actually achieved a long held aim with the help of the Israeli Air Force. Perhaps their choice to use the school itself, rather than just the land around it, as a rocket launching site (if we are to believe this was indeed happening) was planned all along. Two (or is it three) attacks since September 2007 by different militant groups failed to close the school. Now the militants must surely be rejoicing. In an ideal world one would hope that religious and educational institutions would be separate and apart from politics, but this doesn’t seem to be. For the children, teachers and administrators who have managed to keep the school open and functioning since the beginning of the school year in 2007, I offer my extreme condolences that life in Gaza has become so much harder yet again. My thoughts are with you, and my hopes are that the international community can take charge of this situation and stop this on-going senseless conflict. Perhaps international educators can voice their concerns through as many avenues as possible. I am heartsick at the death of Mr. Abu Gleg and the loss of your school in Gaza.My hope is that there can be Peace in Gaza in the near future. Please let me know how we can help you. This is a most regrettable incident. However, I have learned that the American School of Gaza was used by the Hamas terrorists as a launch site from which rockets were fired into Israel.It is too bad that the school was forced into this position by the ruling Hamas terrorists. I hope that the school will learn from this terrible experience. I was shocked and saddened to hear about the destruction of AIS, Gaza and the death of the night watchmen. The students must be entering an examination period and how are they expected to continue their studies without a building or even a peaceful land in which to live. I have the families, teachers and students of the school in my prayers and thoughts and am hoping that there’s an end in sight to the conflict – and very soon. Well, Ii think you should tell everybody about this disaster, at first we thought that this war was against Hamas but i don’t think that this school is connected any way to Hamas, I really fell sorry for this inhuman altitude of the israeli army. How can we help them rebuild? This would be a great charity project for international schools to raise money and/or send materials for rebuilding this school. I know people who worked at the school and was very touched by these colleagues’ commitment to staying and teaching even with disruptions to the daily life of the school. As a community of international educators we should mobilize ourselves to help this school get back on its feet. These kids deserve and need an education. In regard to the AIS Gaza situation there is a web-site petition already in existence for international educators who may wish to voice their support for ending the siege.The petition was started by Dr. Hendrik Taatgen and his wife, Marga Kapka. Dr. Taatgen is a former Director of AIS Gaza. Accomplanying the petition you will find an article by Marga Kapka which recounts her time at American International School of Gaza, and presents a plan for peace in the area, which includes international teachers. I am a teacher at the ESOL school in Abu Dhabi. We have helped our sister school in Gaza before. We will talk as a staff on Monday and see what we can do. I will then let you know. Thank you for your report and your concern! I’m sorry it took so long to get back to you. The night watchman (part owner) was killed in the bombing of our school in Gaza. The school has had only Palestinian teachers for the last 2 years. We’ve also received several notices of family members of our Arabic teachers in Abu Dhabi being killed in Gaza. The situation is much worse than American Media shows! We are collecting blankets, clothing and food and giving it to our Red Crescent (Red Cross) in Abu Dhabi. One of our Sheikh’s has already set aside money and is promising to rebuild all the schools that are destroyed. Sheikh Maktoum from Dubai is working to get the children to Dubai for medical care. We are all trying hard to help. Thanks for your concern. We hope there is some sanity soon! As regards to the destruction of the school, I would like to assure you that the air strikes do not distinguish between schools, homes, and militia areas. You can ask the international aid workers. To stop the rocket attacks, you need to give Gazans the basic human needs like food, shelter, medicine and then education and jobs, so they can dream of a better future for their kids instead of bombing them back to the dark ages. It’s been a busy week, and there have been some interesting developments regarding AISG in particular. 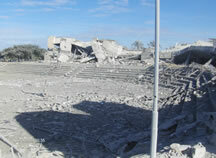 Unfortunately, the news from Gaza is so bad that the destruction of an international school is not even news anymore. I’ve received a number of emails for colleagues regarding the school and the article in ISR. The amount of attention generated through ISR has been very encouraging, and I am hoping that in the end we generate enough support to somehow have a positive impact on the future of AISG and its students. I’ve contacted a number of people from ESOL and I am waiting a response, though I may simply drop in on one of the schools to see how things are progressing. Here in Abu Dhabi there was a large demonstration, and my wife and I are following the news closely to see what specific actions are taking place to see where we can be involved. At this stage I think there are enough opportunities for everyone to be involved to the degree which they feel comfortable. The situation is very politicized and it is very difficult to support one side without condemning the other–and it is far too complicated a situation to be able to effectively point fingers. We are trying very hard to keep our involvement positive–our focus is on improving the lives of our students and Palestinians in general as opposed to condemning and punishing the Israelis…or Hamas for that matter. Again, thanks for you support in this matter. I contacted a number of media sources, and so far ISR has been the most proactive in its response.